Calculations at a uniform antiprism. 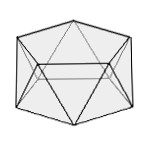 An antiprism is related to a prism, but both otherwise equal bases are twisted to each other for 180°/n. Enter the edge length and the number of vertices of one base and choose the number of decimal places. Then click Calculate.